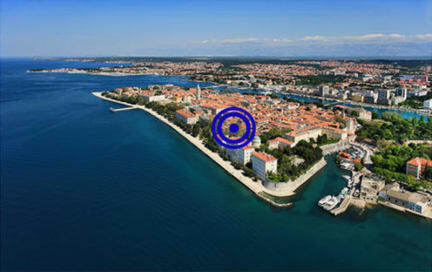 Hostel Elena is a small comfortable hostel located in the centre of the city of Zadar, a small peninsula. The hostel is 30m from the citys boardwalk where you can find many attractions: sea organs (morske orgulje) and sun salutation (pozdrav suncu) all in walking distance. We are only a 15 minute walk from the main bus station and only a mere 5 minutes walk from the ferries, the closest island is 15 minutes away by ferry. Hostel Elena is located between many cafes with sunny terraces, discos and restaurants that offer a typical Dalmatian menu in the cities small streets that cannot be bypassed. During the summer months these little streets can be used for cooling down in the shade but in the afternoon and night-time they turn into live entertainment. The streets are full with live outdoor music and people full of excitement. Hostel Elena is modern and comfortably furnished for a good rest and pleasant stay. PLEASE NOTE: During the peak season we have an age restriction of 18-35. We have the right to refuse stay for those who do not abide to this age limit. Leuke hostel. Personeel was ook heel vriendelijk en altijd bereid om te helpen. Lockers waren groot. Alleen was de keuken een beetje klein. Ik raadt dit hostel echter zeker aan! Matras en kussen was uitzonderlijk goed!